Here is another spread betting specialist that we can add to our growing portfolio and they come in the form of Spreadex. Initially founded in St Albans, UK, in 1999; they have grown into something much bigger since then and have been making huge waves in the world of online sports betting. They now have more than 100 employees under their belt and have even added a casino to their websites, which allows customers to access both their sportsbook and casino from just the one account. Another interesting point about Spreadex is that they also take bets over the telephone, this is something we don’t see that much of these days, as well as the usual mobile and website methods. The layout that Spreadex uses is quite familiar if you are no stranger to online sports betting. They have gone with a very formal colour choice and there is nothing to fall out with. Their homepage is sat on a grey background and most of the markets are in the middle of the screen, in a white text box. In the top left-hand corner you will notice Sportex’s logo and just above this is an option to switch between sports spread betting and regular sports betting, which you can do at any time. Further across on the right is where customers can sign up and login and below is an option to change how you perceive the odds at Spreadex, this can be changed between fractions or decimals. On a header that travels horizontally across the page you will find a menu that navigates you to Spreadex’s sports, casino, financials, in-play, help and open an account sections. If you look on the left hand side of the page, you will notice their full list of sport markets and further down is a section that contains some extras and useful information you might need. Over on the right hand side of the page is where customers will locate their bet slip, this will tot up any potential winnings as you progressively add bets to it and underneath is a widget containing a few of the different in-play games that are both live and upcoming. There is a decent amount of different sporting markets which you customers can get involved and place bets on, these range from Football, Horse Racing, Golf, Financial Bets, Weekender, Tennis, Rugby Union, Rugby League, Politics, Motor Racing, Ice Hockey, Greyhounds, Boxing, Cricket, Australian Rules and American Football. With regards to betting markets, we were quite happy with what Spreadex were offering and some football games, in particular, had more than 275 bets for a single game. These ranged from Total Goals, Corners, Bookings, Multicorners, Shirt Numbers, Performances, Over/Under Goals, Half-Time/Full-Time, Penalties, Extra Time and loads of others. There is more than one way to earn some fantastic stuff at Spreadex, by becoming a customer you could net yourself 2 different versions of an Apple iPad and to do this you will need to do is make £300 or £500 worth of stakes (depending on which version you want). Spreadex also has a free bet for customers who place 3 sports bets, the amount of the free bet will be determined by the lowest stake you placed out of the 3 bets. These are only applicable for some sports and markets within them, so make sure you check for the market you are looking for and that it is included. 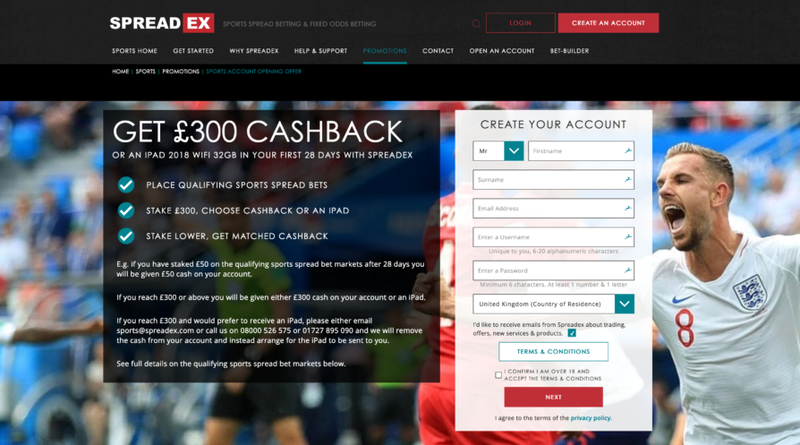 After you have used those bonuses up, you may be happy to know you can also refer your friends to Spreadex to receive a risk free spread bet worth £100 and usable on Total Goals markets. There are terms and conditions relating to this promotion so make sure you read up on how it works. Spreadex have a relatively good in-play console that performed above our initial expectations. There are plenty of different markets to be found, such as Football, Golf, Baseball, Basketball, Ice Hockey, Rugby Union, Tennis and depending on when you check, there could be even more. We were also pleasantly surprised by the amount of betting markets they had for their games, the high profile football matches had upwards of 250 different betting markets that customers can place during the most pinnacle points of the match. Spreadex has everything from Goal Times, Bookings, Correct Score, Goal Scorer, Half-Time/Full-Time, Corners, Handicaps, Player Goal Minutes and the rest. Currently, there isn’t a mobile betting application for Spreadex players to download, this is definitely something that will be looking to implement in the near future, as mobile betting is becoming increasingly popular. The real question is how long can Spreadex hold out for? However, if you are seeking an experience from your portable device, you can access everything from the desktop version of the site, which has been handily scaled down and optimised to fit the smaller screen, by heading over to their website from your mobile or tablet. Customers can use traditional banking methods to credit and withdraw funds from their Spreadex account, these include cards like Switch, Visa, MasterCard, Maestro as well as bank transfers, direct debit and even cheques. Sadly, you wont be able to use e-wallets at this point, but we can almost definitely add this to the list of things they will be looking at including whenever they get round to it. If you need to get in touch with a member of the Spreadex team, you can do so by either telephone, post or email between the hours of 08:00 and 17:30 Monday to Sunday. There isn’t a live chat function so you are limited to only these methods. They have included a detailed FAQ section that we recommend you read if you think your problem might be something that has been previously covered. Spreadex looks and feels very premium in many different ways, they have a fantastic layout that is both unique and very aesthetical as well as good betting markets for regular and in-play betting. They do fall down in some crucial areas, however, such as their lack of live chat customer support, a mobile betting application and by not providing some regular promotions to keep their customers busy. All issues aside they have a solid site that we would recommend to the player who is eyeing up their options and looking for a new sports betting site to try out. You can click below to sign up and get your own account started today.